A great way to feed the squirrels but not the birds. 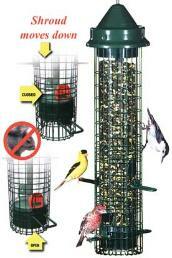 Easy open top allows squirrels to reach in for their food while eliminating Jays and Crows. Fill with peanuts corn or other large seeds. Body removes from mounting plate for easy cleaning. A great gift for the person that has a special "Love/Hate" relationship with squirrels. Our "Feed the Birds" Garden Flag is 12" x 18" and is made of 100% Polyester.